Usutu virus (USUV) is a mosquito-born flavivirus that can infect multiple avian and mammalian species. The viral surface envelope (E) protein functions to initiate the viral infection by recognizing cellular receptors and mediating the subsequent membrane fusion, and is therefore a key virulence factor involved in the pathogenesis of USUV. The structural features of USUV-E, however, remains un-investigated thus far. Using the crystallographic method, we determined the structure of USUV-E in the pre-fusion state at 2.0 angstrom. As expected, the overall fold of USUV-E, with three β-barrel domains (DI, DII, and DIII), resembles those of other flaviviral E proteins. In comparison to other pre-fusion E structures, however, USUV-E exhibits an apparently enlarged inter-domain angle between DI and DII, leading to a more extended conformation. Using our structure and other reported pre-fusion E structures, the DI-DII domain-angle difference was analyzed in a pairwise manner. 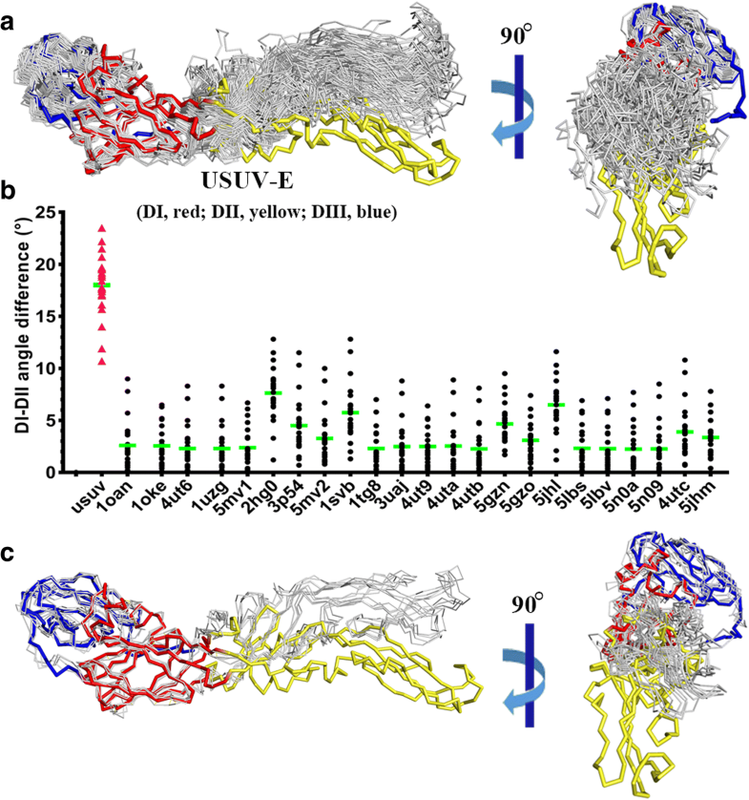 The result shows a much higher degree of variations for USUV-E, indicating the potential for remarkable DI-DII domain angle plasticity among flaviviruses. We report the crystal structure of USUV-E and show that its pre-fusion structure has an enlarged DI-DII domain-angle which has not been observed in other reported flaviviral E-structures. The mosquito-born Usutu virus (USUV) was first identified in 1959 in South Africa [2, 32, 53]. Phylogenetically, the virus is closely related to Japanese encephalitis virus (JEV), West Nile virus (WNV) and Murray Valley encephalitis virus (MVEV), and is therefore categorized into the JEV serocomplex within the Flavivirus genus of the Flaviviridae family [9, 23, 54]. The natural life cycle of USUV involves circulation of the virus between mosquitos and birds such that mosquitos act as vectors and birds as amplifying hosts [8, 45, 48, 49]. In addition to avian species, the virus can also, in incidental cases, be transmitted via mosquito bite to other species including horses, rodents and even humans [5, 10, 46]. Although human cases of USUV infection remain largely asymptomatic, the USUV-related severe diseases such as fever, rash, and meningoencephalitis have also been reported [6, 17, 42]. Furthermore, in laboratory infected mice, the virus could be detected in multiple organs and tissues, including brain, heart, liver, kidney, lung, and etc., demonstrating the pathogenic potential of the virus in mammals [1, 33]. It is notable that several serological surveillance studies have demonstrated the low-prevalence circulation of USUV in the European population, raising the risk of potential USUV outbreaks in humans . As with other flaviviruses, USUV is an enveloped virus which contains a positive-sense, single-stranded RNA genome. This genome encodes a large polyprotein precursor that would be later, via virus-encoded and host proteases, proteolytically processed into three structural (including core (C), pre-membrane (prM), and envelope (E)) and eight non-structural (NS1, NS2A, NS2B, NS3, NS4A, 2 K, NS4B, and NS5) proteins . Of these, the surface-located E protein recognizes cellular receptor/(s) and mediates subsequent fusion between the virus envelope and the lipid bilayer of host cells, and is therefore a key player initiating the viral infection . Structural investigations on flavivirus E protein have revealed a strand-dominated fold with three β-barrel domains . Domain I (DI) is centrally located in the molecule. It connects on one side to domain II (DII) via four polypeptide chains and on the other to domain III (DIII) with a single polypeptide linker. Unlike DI which is overall of globular shape, DII is an elongated structure. A highly hydrophobic fusion peptide is located in this domain, residing at its distal end. DIII folds into an immunoglobulin (Ig)-like structure, and is believed to be involved in receptor binding and also the major target of neutralizing antibodies. In mature virions, E protein assembles, in a “head-to-tail” mode, into pre-fusion dimers, shedding the fusion peptide from premature exposure . During viral entry, E protein would experience large acidic-pH-induced structural re-arrangements via motions of the DI-DII and DI-DIII domain hinges, which would finally lead to the formation of post-fusion trimers and the simultaneous exposure of its fusion peptide for membrane fusion . The functional importance of E in the flaviviral life cycle makes the protein a favorite target for structural studies. While the E structures of multiple flaviviruses, including dengue virus (DENV), JEV, WNV, Zika virus (ZIKV), Tick-born encephalitis virus (TBEV), and etc., have been reported [4, 11, 13, 20, 26–29, 34, 39–41, 51, 57], the structural features of USUV E protein (USUV-E) remains elusive. In this study, we reported the atomic crystal structure of USUV-E in its pre-fusion state. As expected, USUV-E also folds into three β-barrel domains and exhibits an overall extended conformation. Despite that only a single USUV-E molecule is present in the crystallographic asymmetric unit, a head-to-tail dimer similar to other flaviviral E structures could be observed via symmetry operations. While the overall USUV-E structure resembles those of other flaviviral E proteins, its DII connects to DI in a more extended manner, leading to an apparently enlarged DI-DII inter-domain angle. Via structural comparisons, we further showed that USUV-E, among representative pre-fusion E structures, exhibits a much higher degree of domain-angle variations between DI and DII, which we believe represents potential evidence for a remarkable DI-DII angle-plasticity among flaviviruses. The coding region for ectodomain residues 1–409 of the envelope protein from USUV (GeneBank: YP_164819) was synthesized by the GENEWIZ corporation and cloned into the bacterial expression vector pET21a with a C-terminal 6 × His-tag by restriction digestion sites of Nde I and XhoI. For protein expression, the recombinant plasmid was transformed into E. coli BL21 (DE3) cells, and a single colony was picked up and inoculated into 10 ml LB medium for overnight growth. The subsequent cell culture were then transformed into 1 L of fresh LB medium at the volume ratio of 1:100 and allowed to grow at 37 °C until the OD600 reached 0.6–0.8. Then, isopropylthiogalactoside (IPTG) was added into the culture at 1 mM to induce the protein expression. After induction at 37 °C for 6 h, the cells were collected and analyzed by SDS-PAGE. For inclusion bodies preparation, the harvested cells were lysed by sonication in a buffer consisting of 20 mM Tris-HCl, pH 8.0, and 150 mM NaCl. Next, the lysate was centrifuged at 15,000 g, and the pellet containing the protein inclusion bodies was washed three times with 50 ml of wash buffer (50 mM Tris-HCl, pH 8.0, 0.5% Triton X-100, 300 mM NaCl, 10 mM EDTA, 10 mM DTT). Then, the purified inclusion bodies were re-suspended in 40 ml of re-suspension buffer (50 mM Tris-HCl, pH 8.0, 100 mM NaCl, 10 mM EDTA, 10 mM DTT) to remove the residual Triton X-100. After centrifugation at 15,000 g, the final inclusion-body pellet was solubilized in dissolution buffer (6 M Gua-HCl, 10% glycerol, 50 mM Tris-HCl, pH 8.0, 100 mM NaCl, 10 mM EDTA, 10 mM DTT) at 30 mg/ml. The USUV-E protein was expressed as inclusion bodies and then refolded in vitro using the diluted refolding method  with some modifications. Briefly, aliquots of inclusion bodies were diluted dropwise into a refolding buffer consisting of 100 mM Tris-HCl, pH 8.0, 600 mM L-Arg HCl, 2 mM EDTA, 5 mM reduced glutathione, 0.5 mM oxidized glutathione, and 10% glycerol, and then refolded overnightat 4 °C. Subsequently, the refolded protein was concentrated using an Amicon Stirred Cell (UFSC40001) concentrator with 10 kDa cut off membrane and then adjusted to 20 mM Tris-HCl, pH 8.0, 150 mM NaCl, and 5% glycerol. Then the refolded E protein was further purified in an AKTA Pure System by gel filtration on a Superdex 200 increase 10/300 GL column (GE Healthcare). The purified USUV-E protein was concentrated to 8 mg/ml. The crystallization trials were performed with 1 μl protein mixing with 1 μl reservoir solution and then equilibrating against 70 μl reservoir solution by sitting drop vapor diffusion at 18 °C. The initial crystallization screening was performed using the commercially-available kits (Hampton Research and Molecular Dimensions). Conditions that can support crystal growth were then optimized with the hanging-drop vapor-diffusion method. High-quality crystals were finally obtained under a condition composed of 0.1 M HEPES, pH 7.5, 10% w/v Polyethylene glycol 8000, and 8% v/v Ethylene glycol. Diffraction data were collected at Shanghai Synchrotron Radiation Facility (SSRF) BL18U1. For data collection, all crystals were cryo-protected by briefly soaking in reservoir solution supplemented with 20% (v/v) glycerol before flash-cooling in liquid nitrogen. The collected data were processed using HKL2000 . The structure of USUV-E was determined by the molecular replacement method using Phaser  with the structure of WNV-E protein (PDB: 2hg0) as the search model. The atomic model was completed with Coot [14, 15]. Rounds of refinement was performed with REFMAC5 , and finally with Phenix[47, 58]. The final model was assessed with PROCHECK . Final statistics for data collection and structure refinement are presented in Table 1. All structural figures were generated using PyMOL (http://pymol.sourceforge.net). The USUV-E structure has been deposited into the Protein Data Bank with a PDB code of 6A0P. USUV-E, with a canonical type I transmembrane topology, contains a large N-terminal ecto-domain (residues F1-R450) (Fig. 1a). To gain insight into the structural features of USUV-E, the ecto-domain region of the protein spanning amino acids F1-A406 was first engineered to include a C-terminal 6xHis tag and then expressed in E. coli. 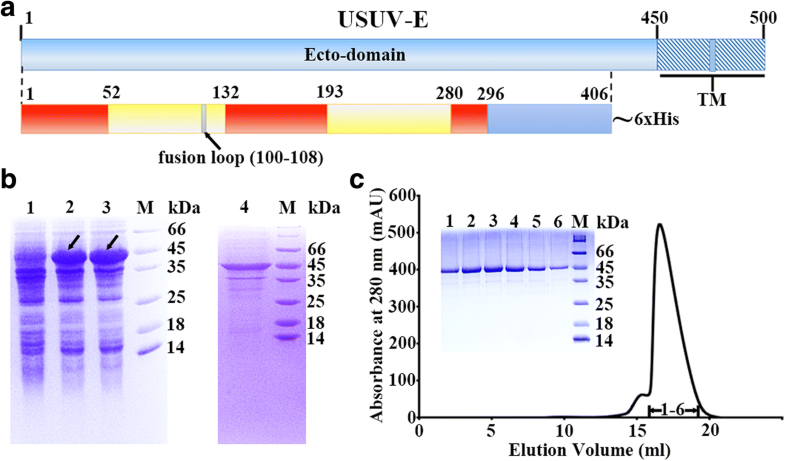 Following several previous reports on flaviviral E-preparations [13, 20, 27], the resultant USUV-E protein was initially expressed in the form of inclusion bodies (Fig. 1b), and subsequently refolded and further purified to homogeneity by gel filtration chromatography (Fig. 1c). Via crystallization screening, crystals of USUV-E that can diffract to 2.0 Å were successfully obtained via the hanging-drop vapor-diffusion method. The structure was solved by molecular replacement and finally refined to Rwork = 0.214 and Rfree = 0.247, respectively (Table 1). Within the crystallographic asymmetric unit, a single USUV-E molecule was present, and clear electron densities were successfully traced for USUV-E amino acids F1-R406 as well as for four terminal His residues of the fusion tag. As expected, USUV-E also folds into three domains (DI, DII, and DIII), showing an extended and a β-dominated structure (Fig. 2a). DI is composed of nine β-strands (A0-I0), forming a compact barrel structure. One helix (α1) is present in DI, sterically situating in the vicinity of the A0C0D0E0F0 sheet and also of the molecule N-terminus (Fig. 2a). It is notable that this helix is also observed in the structures of E proteins from other JEV serocomplex members (eg. WNV and JEV) but not of other flaviviral E proteins (Fig. 2c-d). We also noted that this helix is, along the E protein sequence (Fig. 2e), located in the E0F0 inter-strand loop (also called the glycan loop) where a glycosylation site locates. The USUV-E protein prepared in this study, however, lacks any glycosylation modifications at this site due to expression in E. coli. Nevertheless, when comparing our protein to a similarly eubacteria-yielded JEV protein without glycan decoration and an insect-cell-generated WNV protein that contains glycan modifications, their structures revealed both well-aligned E0F0 loops and the α1 helices (Fig. 2c). The formation of such a helix in the USUV, JEV, and WNV E proteins is therefore unlikely affected by the glycosylation status of this glycan loop. In light of the high conformation-variability observed for this glycan loop in other flaviviral E structures (Fig. 2d), we believe this extra α1 helix is likely a novel feature of the JEV serocomplex viruses. Sterically, DI is located in the center of the E molecule and is further flanked on one side by DII and on the other by DIII (Fig. 2a). DII consists of 8 strands (a-h) and 4 helices (αa-αd), exhibiting a rather extended conformation. This domain can be further divided into two subdomains (subdomain I and II). The latter directly connects to DI via four polypeptide linkers and is composed of a four-stranded (a, d, e, and f) anti-parallel β-sheet and three α-helices (αb, αc, αd); while the former is located at the distal end of the molecule, showing a β-barrel fold with three long strands (b, c, and d) at the bottom and two small ones (g and h) on the top. The fusion peptide, with amino acids G100-F108 is residing in subdomain I. It is also noteworthy that the DII d strand, which is of great length, exhibits a twisted conformation and extends from subdomain I to subdomain II (Fig. 2a). DIII is also a β-barrel structure. It contains in total 6 anti-parallel β-strands (A-F), assembling into an overall Ig-like fold. The inter-domain angles between DI-DII and DI-DIII were calculated to be 144.4° and 153.6°, respectively. On the whole, the solved USUV-E structure is quite similar to those of other flaviviral E proteins [13, 20, 27, 29, 34, 39, 41]. We then characterized the possible dimeric architecture of USUV-E using our structure. As expected, a head-to-tail USUV-E dimer which resembles previously reported flaviviral pre-fusion E-dimers could be generated via simple symmetry operations (Fig. 2b). In this dimer form, the highly hydrophobic fusion loop is readily concealed from the bulk solvent by the DIII domain of the other molecule. To further characterize the similarities and differences between our structure and other reported pre-fusion E crystal structures, those from DENV [28, 41, 57], JEV [26, 27], WNV , ZIKV [4, 13, 28, 51], and TBEV  (either in the free form or in the antibody-bound form) were selected and superimposed for structural comparison. While the DI and DIII domains could be well aligned, an astonishing oriental difference was observed for the DII domain such that it connects to DI in a more extended manner in USUV-E and therefore leads to an obviously enlarged inter-domain angle (Fig. 3a). This makes USUV-E an E protein with the largest DI-DII angle characterized thus far. To learn, in a more quantitative way, the observed domain-angle variations between DI and DII among these structures, the angle-difference was calculated for each structure pairs and then plotted in cluster for each structure group. As shown in Fig. 3b, in comparison to other E-structures which yield angle-differences ranging from ~ 0–12.8° (with an average ranging from ~ 3–7.8°), a much higher degree of variations was observed for USUV-E (with angle-differences ranging from ~ 10.7–23.5° and an average of ~ 18°). It is notable that such domain-angle variations between DI and DII have been widely observed in crystal structures of flaviviral E proteins, for which the crystal packing forces might also play a role. We therefore selected the cryo-EM structures of JEV [38, 52], ZIKV , and a representative dengue virus (DENV-2)  for a similar domain-angle comparison. Similar to those observed with the E crystal structures, USUV-E is also the most extended pre-fusion structure analyzed in this study (Fig. 3c). We also noted that four His residues of the fusion tag are also traceable in our structure and extend towards DII. Nevertheless, these amino acids are far away (~ 16.6 Å) (Fig. 2a) from physically interacting with DII residues and are unlikely the reason causing the increased DI-DII angle. We therefore believe the enlarged domain-angle between DI and DII in USUV-E is an intrinsic structural feature of this viral protein. It should be noted that the inter-domain motion is commonly observed in flaviviral E proteins and has been proposed as a prerequisite for the pre-fusion to post-fusion transitions [37, 44]. Nevertheless, the DI-DII angle-difference as high as shown for the USUV-E structure reported in this study has not been observed previously. We believe this may represent potential evidence for a remarkable DI-DII domain-angle plasticity among flaviviruses. Our structure also indicates a notion that flaviviruses have evolved to adjust to accommodate species-specific dimeric arrangements featured with their variant DI-DII domain-angles. Finally, a couple of potent neutralizing monoclonal antibodies (mAbs) against JEV and WNV, including A3, B2, E3, E113, NARMA3, 503, and CR4354, have been reported [12, 18, 22, 30, 35, 50, 55]. It is notable that among these, CR4354 recognizes E-epitopes locating in the DI-DII hinge region [21, 50]. We noticed that the hinge-residues recognized by CR4354 are largely preserved in USUV-E (Fig. 2e). Nevertheless, the observed enlarged DI-DII domain-angle of the USUV protein raises the possibility that these amino acids might occupy variant steric locations. It is therefore worth studying in the future to learn if CR4354 (or any other JEV serocomplex mAbs that target the DI-DII hinge region) could also be potentially used to prevent USUV infections. We thank the staff of BL18U1 beamline at National Center for Protein Sciences Shanghai and Shanghai Synchrotron Radiation Facility (Shanghai, People’s Republic of China) for assistance during data collection. This work was supported by the National Key R&D Program of China (Grant No. 2016YFC1200305), the National Natural Science Foundation of China (Grant Nos. 81522026 and 31570157), the Sichuan Outstanding Youth Science & Technology Funding (Grant No. 2016JQ0001), and the Outstanding Youth Foundation of Sichuan University (Grant No. 2016SCU04B01). GL and ZMC contributed to the study conception and design. ZMC performed the experiment and data analysis. FY, SL, FY, YC were involved in data collection and structure determination. GL and ZMC wrote the manuscript, ZJC and YC checked and revised it. All authors read and approved the final manuscript. Liu X, Zhao X, Na R, et al. 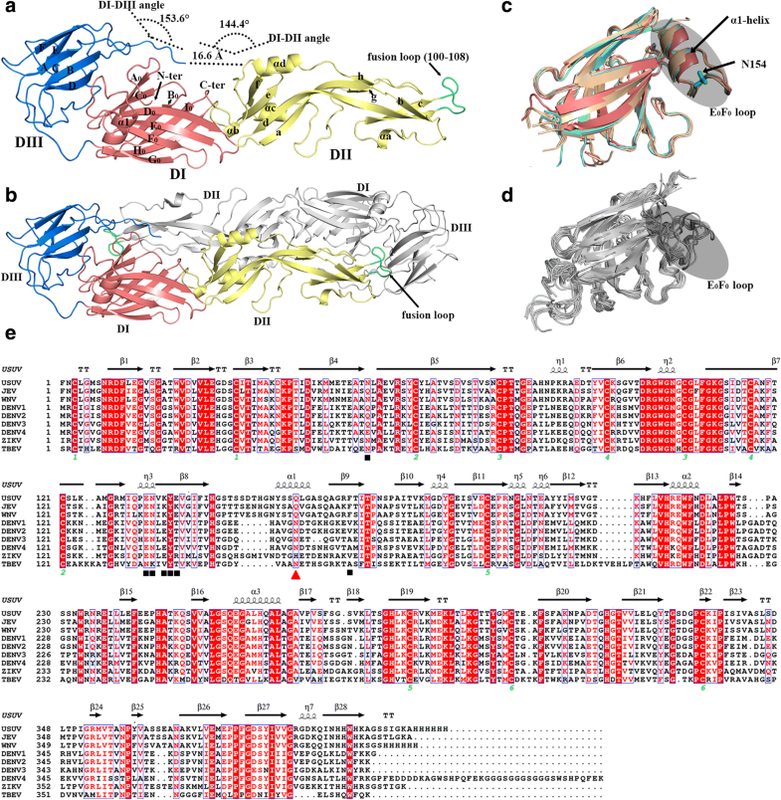 The structure differences of Japanese encephalitis virus SA14 and SA14–14-2 E proteins elucidate the virulence attenuation mechanism. Protein Cell. 2018. https://doi.org/10.1007/s13238-018-0551-6.